Yes, I'd like to SAVE $20 and download the entire eBOOK SERIES! These Terms and Conditions are effective from January 1, 2012 and are subject to change at anytime. Online payments are processed by Paypal our secure payment provider. Paypal uses SSL technology to guarantee a safe and secure shopping environment. You do not need to be registered with Paypal to submit an online payment. There are no memberships or annual fees associated with your ebook download purchase and all online payments are processed only one-time with no recurring fees. Each ebook purchase includes a unique account identification number that is assigned to you and along with your download you receive unlimited lifetime email support (all questions are answered within 72 hours). All Mr. 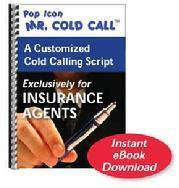 Cold Call™ eBooks and downloads are published by Off The Hook Media™ and are copyright protected and cannot be resold for profit or transferred to another party without the written consent of Mr. Cold Call, Inc. To request such permission and for further inquiries contact copyright@mrcoldcall.com or contact us by phone at 561-828-9294. Once you submit payment through our secure servers you agree that you are purchasing an electronic book ("eBook"). eBooks are downloadable computer files - not physical books. Physical books can be returned for a refund; downloadable computer files cannot.